This is an absolutely stunning dress! Its a simple style but so elegant and beautiful. The dress is a size 12 - street size 10. I am 173cm tall. I have a large bust (12DD) so the cup size on the dress was altered to help with that. If you have a smaller size bust then alterations can fix it. The train on the dress isn't too long that it'll get in the way. The dress has a bustle built in + a loop material underneath the train to put around your wrist. Dress has boning around the waist to prevent creasing. Honestly, this is a stunning dress. If you're not sure, please feel free to contact me to come and try it on! Happy to throw in the Jeannette Maree veil for $100. *Please note* There is small 3cm tear on the bottom of the dress which can EASILY be fixed by alterations. 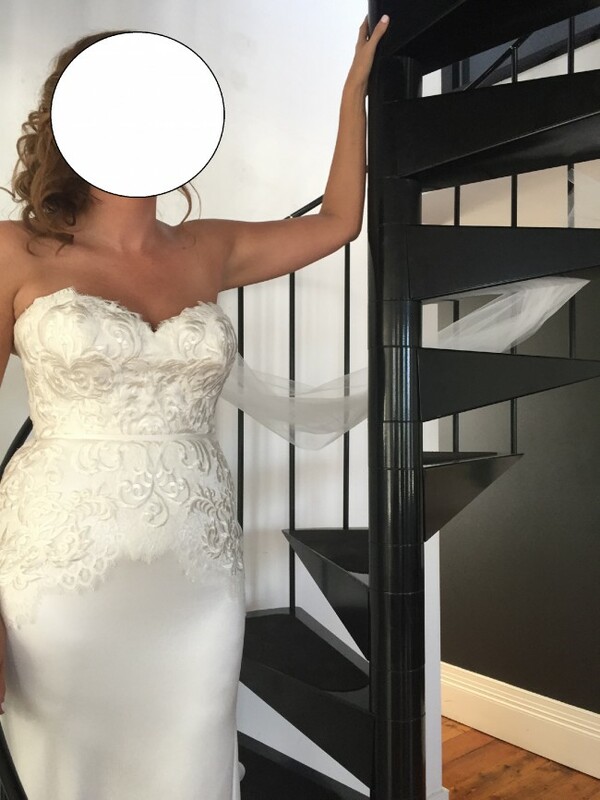 I haven't had it fixed just in case someone shorter than me is interested in the dress and will get the length altered.